2. 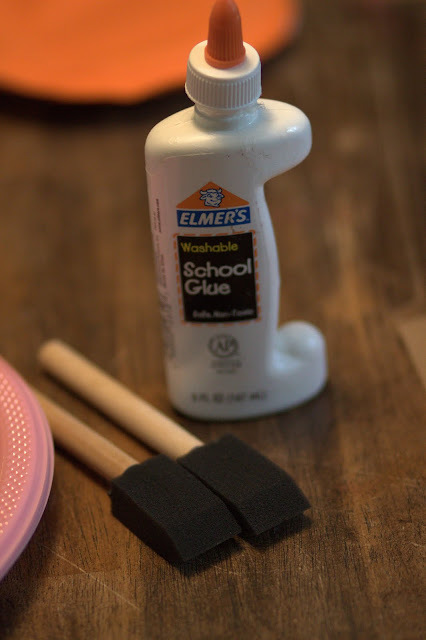 Spread the glue with the brush onto the circular center of the plastic plate. It is best to put the glue on in sections, as it dries quickly. Place the pieces of tissue paper onto the glued surface and be sure to overlap the pieces. You do not want any of the plate showing through. 3. When the entire circular section is covered with tissue paper, let dry. 4. Unfortunately, I do not have a photo for the next step (oops...some day, I'll get this DIY thing right). After letting it dry completely, you are going to peel the "stained glass" pumpkin off of the plate. This is most easily done if you turn the plate inside out. Usually the kids like this part the best. 5. Make a jack-o-lantern face with paper. In the past I've used tissue paper, but we didn't have any, so the kids cut out pieces of construction paper for faces and stems. 6. Hang in a window. These are not the best photos, especially with the screen door in the background, but, they look really great in a sunny window. Note: I have used this project in the classroom with 5th and 6th graders to practice expository writing.. I demonstrated the project, they created a pumpkin and then had to write the step-by-step process with how to do it. You can also do this at Christmastime and make Christmas ornaments. It's definitely on our list for this week.